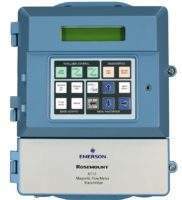 Global engineering specialist Emerson is pleased to announce the launch of its latest innovative monitoring solution, the Rosemount 8712EM Wall Mount Magnetic Flow Meter Transmitter. This latest device is equipped with additional protocols, powerful diagnostic capabilities and usability features to help users in the pulp and paper, metals and mining and other industries gain quick and easy insight into their processes. The meter’s local operator interface was designed using Human Centered Design concepts, making it easier and faster for technicians to navigate in the field. The Rosemount 8712EM’s diagnostic suite includes high process noise detection and ground fault detection. The electrode coating diagnostic offers two set points in order to alert when coating is present and when it is affecting flow measurement, enabling preventative maintenance. Smart Meter Verification continuously monitors the health and performance of the meter for ultimate measurement confidence. Universal transmitter capability allows the 8712EM to operate with any existing magnetic flow meter sensor and allows backwards compatibility with all Rosemount magnetic sensors. This feature not only makes the transmitter easier to integrate with older units, but it also enables the use of the 8712EM’s advanced diagnostic features. The Rosemount 8712EM supports HART 7 for 32-character-long tag capability for reduced start-up time, as well as options for intrinsically safe HART outputs and Modbus RS-485. For more information, please contact Emerson using the enquiries form on this page.